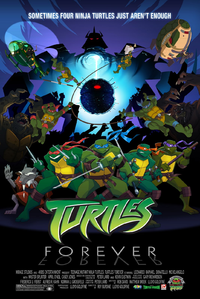 We could not let today go by without mentioning that tomorrow, Nov. 21, is THE DAY when "Turtles Forever" airs on The CW4Kids. The cartoon was made to celebrate the 25th anniversary of the heroes on the half-shell (25 years of turtles? Man, we are OLD) and supposedly features the 1987 turtles meeting up with those from 2003. Then the Wikipedia entry says this, which may as well be written in ancient hieroglyphics as far as me understanding it, but I'm sure some turtle fanatic out there is laughing at my ignorance. "The Mirage Turtles have been confirmed to appear as well, along with Krang, Hun, Karai and three of the Shredder (1987 Shredder, 2003 Utrom Shredder, and Mirage Shredder)." Are Mirage Turtles like Bizarro Superman? I am TMNT illiterate, I guess. Mirage refers to Mirage Studios. The company Kevin Eastman and Peter Laird founded. TMNT was originally a b&w comic book started in 1984. The turtles back then were for more mature readers, as there was blood and violence. These 1984 turtles were in Turtles Forever, and it was awesome.